Ronnie Hunter-Paul signs for Mirfield Stags. The official launch of new rugby league club Mirfield Stags was hailed a huge success with almost 200 people attending an evening at The Railway pub. The event welcomed prospective players, families, friends, supporters and club sponsors to a venue that will be the Stags’ base in 2015. Honorary President Robbie Hunter-Paul addressed the crowd, before introducing coaching duo Richard Silverwood and Simon Hagger. On the recruitment front, the club secured the services of almost 30 players and that number is continuing to rise. The Stags have attracted some notable names, with the bulk of the club’s squad hailing from Mirfield. With pre-season training due to start in less than four weeks time, optimism is high heading into the Stags’ debut season. A club spokesperson said: “We were absolutely thrilled with last week’s launch, it was a key moment for the return of rugby league to Mirfield. 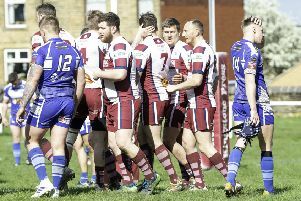 Stags officials have submitted an application to join the RFL Yorkshire Men’s League for next season and, if accepted, Mirfield will play host to competitive rugby league for the first time in almost five years from next March.